Western Digital, best known for their hard drives, has decided to re-enter the solid state market with new Green and Blue series SSDs. This comes just five months after Western Digital completed their acquisition of SanDisk for $19 billion, which gave the company the resources to produce these new products. Similar to Western Digital's hard drive line-up, the Green and Blue series SSDs are entry-level products. The Green line, based on the SanDisk SSD Plus, sits at the bottom to provide the best value. These drives use a basic Silicon Motion controller, SanDisk 15nm TLC NAND, and do not feature a DRAM cache, so low-end performance is expected. Green SSDs will be available in two capacities, 120 and 240 GB, in both 2.5-inch and M.2 2280 SATA form factors, with prices yet to be announced. The 240 GB model is rated at 545 MB/s sequential reads and 435 MB/s writes, along with 37k/68k IOPS random read/writes; the 120 GB drive features slightly reduced performance. Expect to see Green SSDs on the market later this quarter with three year warranties and endurance rated at up to 80 TB. 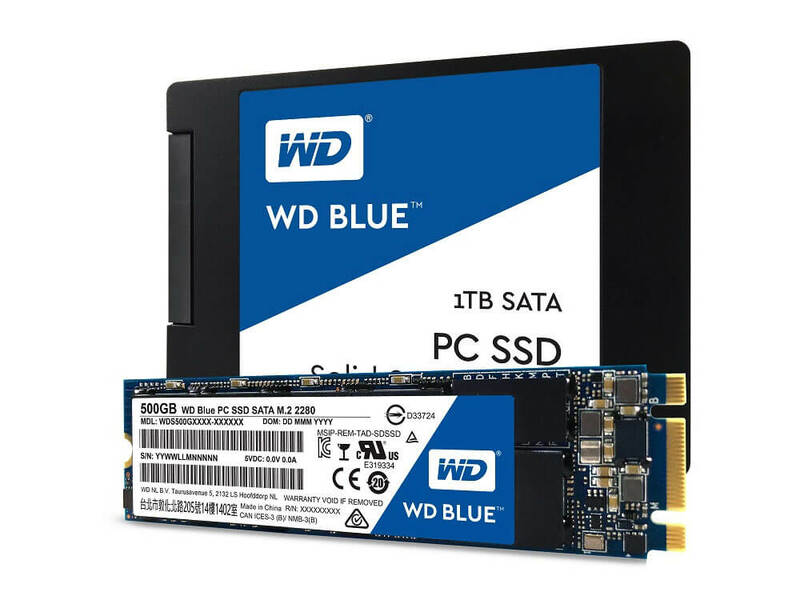 Western Digital Blue drives are based on the SanDisk X400 SSD, and again come in 2.5-inch and M.2 2280 SATA form factors. These drives use SanDisk 15nm TLC NAND as well, but feature a Marvel 88SS1074 controller for improved performance: 545 MB/s reads, 525 MB/s writes, 100k IOPS random reads, and 80k IOPS random writes. The Blue series will include three capacities: 250 GB for $79.99 with slightly reduced performance; 500 GB for $139.99; and 1000 GB for $299.99. All three drives are available now, and sport three year warranties.